You conjecture that the mean and standard deviation of PEF are about = 330 and = 40 for Xilodol and = 310 and = 55 for Brantium, and that each pair of measurements on the same subject will have a correlation of about 0.3. 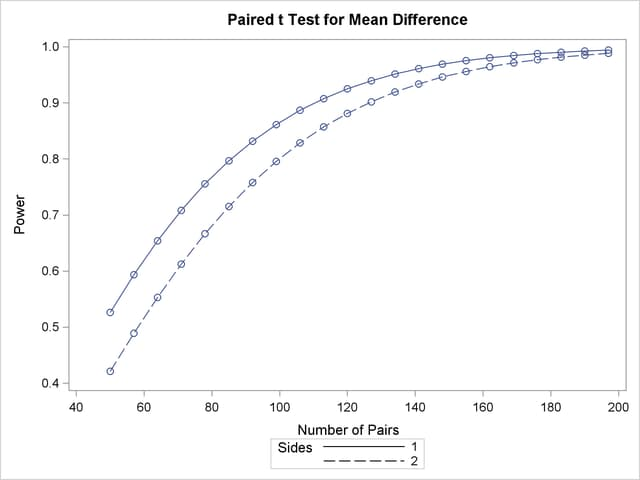 You want to compute the power of both one-sided and two-sided tests of mean difference, with a significance level of , for a sample size of 100 patients and also plot the power for a range of 50 to 200 patients. Note that the allocation ratio of patients to the two sequences is irrelevant in this analysis. The choice of statistical test depends on which assumptions are reasonable. One possibility is a test. A paired or two-sample test is valid when there is no carryover effect and no interactions between patients, treatments, and periods. See Senn (1993, Chapter 3) for more details. The choice between a paired or a two-sample test depends on what you assume about the period effect. If you assume no period effect, then a paired test is the appropriate analysis for the design, with the first member of each pair being the Xilodol measurement (regardless of which sequence the patient belongs to). Otherwise, the two-sample test approach is called for, since this analysis adjusts for the period effect by using an extra degree of freedom. Default values for the NULLDIFF= and DIST= options specify a null mean difference of 0 and the assumption of normally distributed data. The output is shown in Output 70.3.1 and Output 70.3.2. The "Computed Power" table in Output 70.3.1 shows that the power with 100 patients is about 0.8 for the two-sided test and 0.87 for the one-sided test with the alternative of larger Brantium mean. In Output 70.3.2, the line style identifies the number of sides of the test. The plotting symbols identify locations of actual computed powers; the curves are linear interpolations of these points. The plot demonstrates how much higher the power is in the one-sided test than in the two-sided test for the range of sample sizes. The default option DIST=NORMAL specifies an assumption of normally distributed data. The output is shown in Output 70.3.3.